Conquering the Munros and Depression. Today is my 44th birthday and I’d thought I’d look back on my Munro bagging exploits so far. This long running affair with the Scottish Mountains over 3000 feet is nearing its end as I only have nineteen yet to summit. It started back in 1991 when I booked a place on the bus for an outing with the Moray Ramblers to Glen Affric. I had a growing interest in the outdoors and I was keen to get out to the hills that I knew little of. So off we set in glorious September weather bound for the summits of Toll Creagach and Tom a’ Choinich and that time I knew very little of the Munros and even less about the hills we were climbing that day. At the summit of the first hill, I asked one of the party if this was a Munro- he said yes and said in front of everyone that I’d be joining the Moray Mountaineering Club next- which is exactly what happened! Over the next few years with the Moray Mountaineering Club I was a regular on most of the bus and weekend meets to many locations on the west. I tried my hand at summer at winter climbing too, but it never really gripped me- pardon the pun. I did love the narrow and airy ridge scrambles though. On a weekend meet to Glen Etive with the club I was shouting in my sleep and woke everyone up- the joke was that I was having a nightmare about falling of the Aggy Ridge! Next day everybody had different plans, so I decided to head for a solo trip on the Aonach Eagach ridge which I thoroughly enjoyed, and I’m glad to say I did not fall! I was starting to get quite a few number of hills under my belt and was confident to spend many a solo outing on the hills. I moved to Aberdeen for work (again) in the mid nineties and although it was a far greater drive to the west I still got some hills done, but far less than I had been doing. First time backpacking in the hills carrying all my gear and tent was when I did Ben Avon and Beinn a’ Bhuird. I walked over both hills and descended to Faindouran Bothy in Glen Avon and spent the night in the bothy instead of camping. Next day I walked up Glen Avon and down the Lairig an Laoigh towards Derry Lodge. It was at this point I felt really low and didnt want to carry on. I felt awful and didnt know what was wrong with me, but I carried on and made it back to the car at Linn of Dee. This was to be start of my depression. It was five years or so after that I found out what was wrong with me. In between times I walked the hills on and off, but most times I managed to get out there and do something. In the year 2000 (this was still a few years before I was diagnosed with depression) I wanted out of Aberdeen and out of the Motor Trade and then moved to Braemar to work at Braemar Mountain Sports. I enjoyed working and living there and spent many a day off,on the hills and even managed to find the legendary secret howff. I had a job I enjoyed and was living amongst the hills, but all was not well and I was back and forward to the Doctor. Eventually I moved to Aberdeen yet again for another few years and did’nt get many hills done, but did have an enjoyable week off on the West Highland Way. I got signed off work a couple of times with stress apparently, and eventually I moved home to my parents in Aberlour and was working in a new job. Eventually things got really bad and on the first visit to the Doctor back home and he diagnosed me with depression. I couldnt handle work and was signed off. It wasnt all bad though, even although I couldnt cope with work I managed to get back to the solitude of the hills and was enjoying spending my time on the mountains again. During the next five years or so trying to cope and overcome with my illness- I’d get out over a few times over a couple of months, then nothing for a another few and so on. Between 2007 and 2012 I caught the mountain bike bug which was great for my depression and it was good medication for me. I became a good technical rider and did well in a couple of mountain bike races. The walking had been left on the back burner- so no munros for a few years. Fast forward to 2013 and I was living in Aberdeenshire coping reasonably well to a point with my health when I rekindled a relationship with Lynn from my teenage years. I moved back to Moray and worked at Rothes Wind Farm for almost two years. During these two years I did a great amount of biking still, then my other relationship with the hills started to grow again. It started off again with walking a few of the local hills with Lynn. We booked some time off and I took Lynn up her first Munro- Sgurr na Banachdich on Skye! That’s the day I forgot to pack my Lunch and had to share with Lynn. Then my back felt rather wet at the bottom- I thought- am I really sweating that much? But no, my water bladder had started to leak. Those two incidents didnt spoil a great day out on the hills. Since then we have had many great hill days out together on my quest to climb all the Munros. I’ve had to renew much of my gear- new boots clothes, packs and tents etc….. the list is never ending. As my Munros are getting fewer and fewer, this means I’ve left out quite a few remote Munros to do involving a long hike in with a possible camp. I must admit that at first some of these felt like a fair old challenge and that a fair amount of planning would be involved! In the past couple of years Ive managed to get out and climb quite a few Munros and had two holidays bagging many as I could weather permitting including many return visits to the local hills of the Cairngorms as I love the area around Ben Macdui and Loch Avon, not forgetting to mention glen Feshie! My depression hasnt gone, but I’m handling it better than I was, but the great thing is that I feel alive, happy and full of energy when out in the hills! And last year when the weather wasnt so great we took to going away weekends seeking out bothies and sitting round the fire in the winter evenings, and we even took in New Year at Craig Bothy on the West. I’ve now got used to carrying a heavy pack lugging all that wood and coal into bothies! I now seem to caught the backpacking bug and have now done a few trips this year wildcamping and have loved every moment of it. Back in June I did a trip through Glen Tilt to Glen Feshie, then a couple of weeks later I walked in from Kinlochewe and camped at Lochan Fada where I climbed A’ Mhaighdean. On our Munro bagging holiday this year, the highlight had to be getting the train in from Tulloch to Corrour and backpacking over the Ben Alder hills- yes it was tough going at times carrying a full pack over six hills, but the rewards and satisfaction made it my best trip ever with two overnight wild camps at different locations. Back in June I thought to myself that I couldn’t really be bothered with this ticking off hills business anymore simply because I was enjoying the wild places and glens through my new found love of backpacking, but I thought to myself that I had been doing them for years and since I only had 30 to go, that I might as well complete them, and so now I have nineteen munros to go and aim to complete them next year. Whilst I was on A’ Mhaighdean, I met a hill runner doing the Fisherfield six. He swore blindly that he would never wear a big pack on the hills and off he ran in his trainers up the hill. Each and one of us to our own I guess, but I like the slower pace on the hills to absorb more, look at my surroundings, take photos and enjoy the moment. People have asked- will I start doing the Corbetts next? Highly unlikely, but I will revisit some of my favourite hills, do more backpacking and visit many a wild glen and corrie. I’ve also had a plan to combine my love of cycling and backpacking and hope to do some off-road bikepacking next year. I hate cycling on roads as car users tend to be selfish and not give enough room on the roads, but I like cycling the back-roads. I’d like to say a thanks to my girlfriend Lynn for accompanying me on many of these trips to the hills. 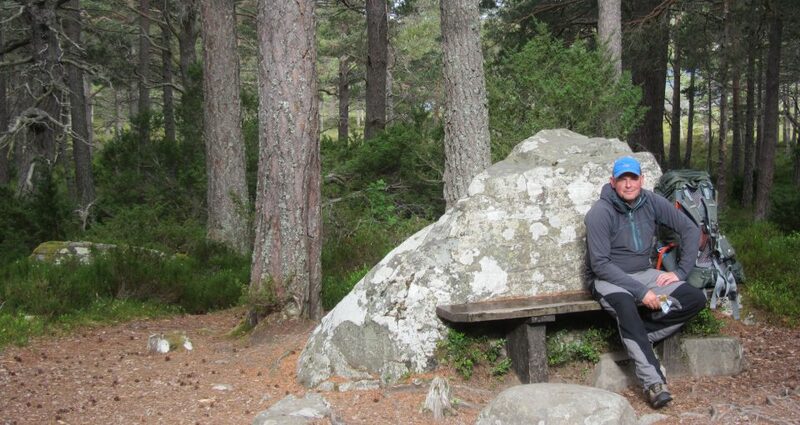 Also I’d like to thank the Moray Mountaineering Club for all the trips I’ve been on with them throughout the years. One inspirational person I’d like to thank is Chris Townsend. I have read many of his articles and books . A big inspiration to me over this past year. To quote- going to the hills isn’t escaping reality, it is in fact escaping to reality. Here’s to the last nineteen!